I'm pretty sensitive to strong fragrances therefore I have to use a lot of fragrance free products including laundry soap. Because of my overly sensitive nose I've always used All Free and Clear simply due to the fact that it's odor-less. When I find a product that doesn't give me a headache I use it even if it's not the greatest. I was given the opportunity to try Tide Coldwater laundry soap and I decided to take a risk and try a new brand of detergent for my household. I'm glad I took the leap over to Tide Coldwater, it has such a subtle fresh scent that it doesn't even bother my sensitivity. In fact my laundry actually smells clean now! 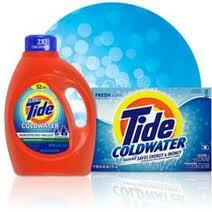 Tide Coldwater is specially formulated for cold water conditions so I can save energy and money! It’s specially designed formula removes stains better in cold water than my other detergent did in warm water. Especially in times like this when so many of us are struggling and trying to save in every way possible it’s great to know I'm also saving money simply by my switch to Tide Coldwater. 80 percent of energy used to wash clothes comes from heating the water, that adds up to a lot of savings by washing our clothes effectively in cold water. Anyways, as I was folding my clothes I noticed how wonderfully clean they smelled, maybe that's because they actually are much cleaner now than with my previous brand. I'm so happy with my leap over to Tide Coldwater, I'm impressed with the brilliantly clean freshness! Though I received a sample of the product and a giftcard form Tide and SheSpeaks for this review, all thoughts and opinions are and continue to be my own. Thank you so very much Tide/SheSpeaks!